High blood pressure has been called the silent killer – there are no symptoms, just as other kinds of disease can creep up on you without you becoming aware. 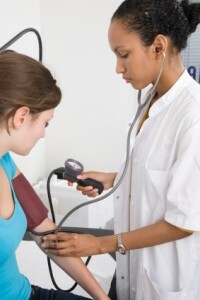 According to the Mayo Clinic, high blood pressure develops over a number of years and affects most everyone. Risk factors to develop it include age, race (it is more common among blacks), family history (my boga-boo), being overweight, not being active, using tobacco or too much salt, using too little potassium or vitamin D, stress, drinking too much and other chronic conditions. My family history includes colon cancer on both sides, from multiple members as well as high blood pressure. I recently had my once every 5 years colonoscopy – an experience you will never forget! While doing my prep, the nurse noted that my blood pressure was high. When she said how high, it was a bit scary – however, I chalked it up to the stress of the prep for the exam and nervousness over the procedure. I don’t like medicine. It serves a purpose of course and extends lives, but if there is a non-prescription solution to wait ails me, I want to use it instead! I have been pre-hypertensive for years – with my pressure hovering around 130 over 80, but this time it was way over that. Home monitoring of blood pressure. Because I wanted to see if the pressure was up all the time, I decided to monitor from home. To do so, I bought one of those auto magic blood pressure monitors – the ones where you just put on the cuff and push a button. It works great, unfortunately it is confirming high blood pressure. Ways to lower blood pressure. Now my quest is to somehow get that pressure back down. I’m no doctor or nurse, but common sense and things I’ve read and researched indicate that eating right, exercising, managing stress, avoiding tobacco, limiting alcohol and losing weight may help. I already exercise, eat fairly well, don’t smoke and seldom drink. My stress level has come down considerably and I am actively taking steps to eliminate it from my life. I am adding more walking (I have been doing at least a half mile 5 days a week and I am upping that to 2 – 3 miles), continuing my exercise, attempting to lose 10 pounds and change my diet a bit. If those things don’t work, I’ll blame my genes and hit the doctor up to see what she says to do. Lifestyle changes include eating foods that help with the fight. There is actually a diet (DASH) that is purported to lower pressure by 7 to 10 points systolic in just a few weeks. But who can follow a strict diet? I wanted to find foods that research has shown to help with blood pressure issues. Here are 5 I found. 5 foods to help lower blood pressure. 1. Potassium filled foods – bananas, avocados, sweet potatoes, red beans, squash and even baked potatoes. Potassium helps neutralize the salt in your body. It is hard to get away from salt if you eat processed food at all, so making sure you get adequate potassium apparently can really help. 2. Fiber foods – oatmeal, bran, flax seed. Studies show that folks with high fiber diets lower their blood pressure, even when it is high. 3. Foods with a uric acid kick – an apple a day keeps the doctor away! And, of course, apples have fiber too! 4. Foods rich in anthocyanins – blueberries, strawberries, paw paws. The anthocyanins are said protect against hypertension. These fruits also contain anti-oxidents that help protect cells from free radicals. A limited amount of red wine per week also provides some assistance, if you already drink (don’t start for this purpose though!). 5. Nitrate rich foods like beet juice (which according to some studies can lower pressure in hours), whole beets, spinach, lettuce and carrots. The natural nitrate acts just like the nitrate in the pills to lower blood pressure. I love all the foods you listed and eat them quite often. My favorites are strawberries and blueberries. When strawberries are in season, I often have grape nuts with sliced strawberries for breakfast. I wonder if my diet is why my blood pressure is typically 90/60. 90/60 sounds really low to me – is your doc ok with that? This year we have been steadily eating a mix of blueberries, sliced strawberries and sliced bananas – yum! Hi Marie, They are OK with 90/60. I did have an allergic reaction to a drug that my oncologist prescribed that knocked my BP down to 70/45. They weren’t very happy with that. My wife has been making smoothies using overripe bananas that she freezes along with strawberries. She throws them in the blender for a tasty afternoon snack. She also sometimes makes a banana creme that is like frozen yogurt by blending the frozen bananas with some chocolate sauce. She doesn’t blend the bananas as long for this as when she makes smoothies. Now you are just making me hungry! I hear you! Once we get on the meds, the docs are usually reluctant to take us off! Great source of information on the different food to lower blood pressure. Having a high blood pressure can cause a lot of complications and more serious health problems that is why it is imporant that we find ways to reduce it. All these food you mentioned here is really going to be helpful and personally, i eat everything you mentioned here. Thanks for dropping by. I think my new diet is starting to have effect as I am seeing some downward pressure on my numbers.